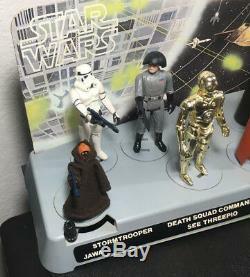 Vintage 1977 First 12 STAR WARS Action Figures with rare Kenner Early Bird Stand COMPLETE AND UNPLAYED WITH. 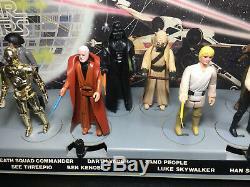 Here you are looking at a lot of complete First 12 Kenner Action figures with Early Bird Mailaway Stand and Backdrop. 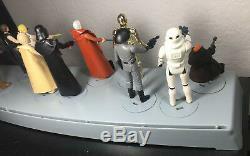 All figures as well as the Mailaway Stand and Backdrop are original, complete, and unplayed with. Weapons are original and float and light tested to insure authenticity. 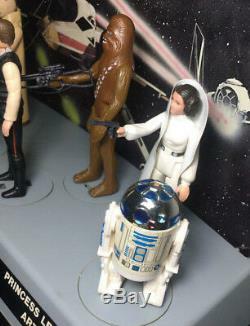 Leia has her correct Early black blaster. Capes have no rips or tears and look great. C-3PO also has a small amount of give to his legs, though limbs are mostly snug. 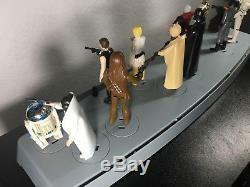 R2 has a small amount of peeling on the top left corner of sticker, but otherwise, he is very nice with good coloration and dome that clicks. Mailaway Stand and Backdrop are also unplayed with. Front Sticker looks spectacular, all stand pegs look great and are unbroken. And all 3 figure rotators function great. Backdrop also looks Near Mint. There is a bit of mild wrinkling particularly on the bottom left corner and top center portion. But very, very nice overall. 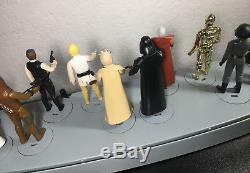 I have owned a number of Mailaway stands over the years, and this is one of the best that I have come across in my long years of collecting. EVERYTHING YOU SEE IS 100% ORIGINAL! 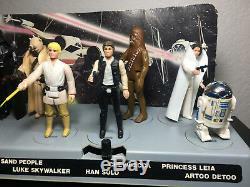 The item "Vintage Star Wars First 12 Figures Early Bird Mailaway Stand UNPLAYED WITH" is in sale since Saturday, December 15, 2018. This item is in the category "Toys & Hobbies\Action Figures\TV, Movie & Video Games". 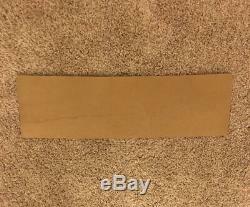 The seller is "vintagecollectiblesandtoys" and is located in Carrboro, North Carolina. This item can be shipped worldwide. 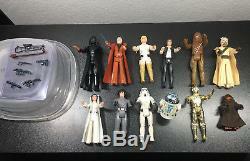 Character: Luke, Leia, Han Solo, Chewie, and More! Bundle Description: FIRST 12 EARLY FIGURE COLLECTION ~ ALL 100% COMPLETE!